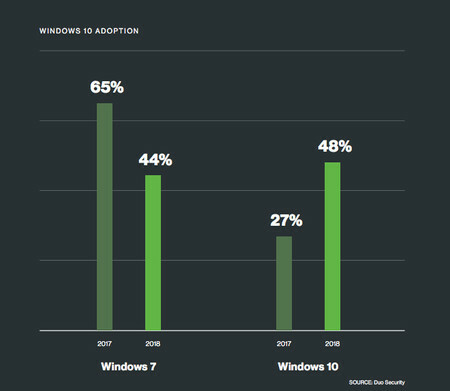 Despite all the resistance that companies usually offer to move to new versions of the operating system, not only for costs but for trying to maintain the stability of their platforms, and other times for simple laxity, Microsoft has managed to get Windows 10 to be adopted by 48% of business users . This is indicated in the annual report of the Duo analysis firm . His data shows that the use of Windows 10 in business systems has increased by 21% since 2017 , which has caused Windows 7 to lose its position as the dominant system in this sector. This increase in market share is mainly attributed to the efforts Microsoft has been making to educate users to always update to the latest version of the system due to its advanced security features. Features that helped many to stay safe from recent disastrous vulnerabilities such as WannaCry . Another important factor is the fact that Windows 7 will no longer have extended support in 2020 , and its quota continues to decline from the Windows 10 exit. Among the business users Windows 7 had 65% share in 2017, and for this year the numbers have dropped to 44%. Clearly, Microsoft’s strategy to keep its users in the latest version of Windows 10, is working. With Windows 10 it took Microsoft three years to convert its new flagship system into the dominant version. At the beginning of the year they said that Windows 10 already had many more installations than Windows 7 , and in the last conference Build 2018 said that the system had already reached 700 million installations. All these numbers agree with the same trend, even in segments like in the gamers of the Steam platform , Windows 10 has become the favorite system to play. If we add to this that the latest update of Windows 10 is already in more than 50% of the equipment worldwide and has been the fastest has been distributed of all, clearly Microsoft’s strategy to keep users in the latest version, it is working.